Day 1: Meet and transfer from Tocumen International Airport to the Gamboa Rainforest Resort: Located only 30 minutes of the Chagres River and Panama Canal. Enjoy the exotic retreat far from the noise and bustle of the city! Colorful sights, natural wildlife and luxurious accommodations make the Gamboa Rainforest Resort a one-of-a-kind experience and is a perfect start for your Adventure Tour around Panama! Overnight at Gamboa Rainforest Resort in a deluxe room. Day 2: you are booked today for a “Gatun Expedition” tour boat. Navigate on the Chagres River passing the historic bridge of Gamboa and arriving at Gatun Lake, which is the world’s second largest artificial lake with 423 square kilometers. After lunch, the other tour offered is the Aerial Tram, which rises on a tour of several kilometers from the mainland through the silent forest. There you can see a variety of birds mingled with a thousand shades of green of different species of trees.. Overnight at Gamboa Rainforest Resort in a deluxe room. Day 3: Free day. Night at Gamboa Hotel. Day 4: Our driver will take you to the Albrook Domestic Airport where you take a flight to David, capital of the Chiriquí province. After only one hour flight duration, we will take you from David to Boquete: a beautiful, small town of about 20,000 people in the western highlands of Panama, situated between the Caldera River and Baru Volcano and famous for some of the sweetest oranges and the richest coffees in all of Panama! You will stay at thePanamonte Hotel. Overnight in a suite. Day 5: You will explore the ‘Quetzales Trail’, one of the most beautiful trails in Central America. The trail cuts through some of the province’s most pristine, protected forest, offering spectacular views of the surrounding valley! During the hike, you will spot a great variety of trees, plant sand bird species, including the Resplendent Quetzal, the Silvery-fronted Tapaculo, Silvery-throated Jay, Black-faced Solitaire and the Barred Becard. Another night at the ‘Panamonte’. Overnight in a suite. Day 6: H alf day Coffee Tour: Take part in the process of bringing coffee from the cherry to the cup! You will learn everything about the coffee process, from when the coffee tree is planted and starts growing, until the way coffee is brewed for you to drink it. You will also have a glance of the shade grown technique which only allows the precise amount of sun on each coffee tree and protects the environment. And you will end with a cupping, in which you will sample different flavors and roasts. ‘Panamonte’ for the night. Overnight in a suite. Day 7: You will be taken to the hotel Bocas del Mar in Chiriqui, a breathtaking boutique hotel that offers you the luxury of today. 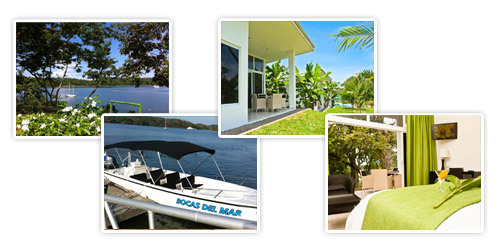 The exclusive location on the coast, on the mainland in Boca Chica, is perfect to guarantee a totally relaxed holiday. Bocas del Mar has been voted by TripAdvisor at the top hotel in Panama in 2019. Day 8: Do you prefer to relax or rather from adventure? Everything is possible! Immerse yourself in the two infinity pools, sunbathe on the large terraces or on the private bay. Or let yourself be pampered in our stylish restaurant with bar. During this time, you will enjoy a breathtaking scenery, sailboats lounging on the water and islands as a backdrop. Day 9: Flight back to Panama City. Upon arrival, a driver will take you to Hotel Bristol. Overnight in a Deluxe Room. Day 10: Partial Canal Transit Tour: In the morning, you will be collected for your transfer to Flamenco. There you will take the tour bus, which will take you to the Gamboa area, where the trip starts. You will transit Pedro Miguel Locks. When entering Pedro Miguel Locks you will experience a drop of 9 meters in one step and find the Miraflores Lake, an artificial lake that connects Pedro Miguel Locks and Miraflores Locks. Afterwards you will enter the last set of locks called Miraflores Locks in the Pacific Ocean. You will be sailing the Pacific Ocean on the way to the disembarkation point at Amador Causeway, passing under the Bridge of the Americas (‘Puente de Las Americas’). Panama Bay will be the end of this unique trip. Another night at Hotel Bristol. Overnight in a Deluxe Room. Day 11: At the appropriate time, transfer to Tocumen International Airport.